I'm sure you guys aren't ever like me, stuck in the shower desperate for a shave and no shaving cream in sight. I can never bring myself to buy it. I've got so much crap in my bathroom (lotions, soaps, creams, hair care) that I've never made shaving cream a priority. I usually just grab the hair conditioner. Which means I always run out of conditioner before the shampoo. Annoying. And doesn't shaving cream seem like a guy thing? Nothing manly, however, about Victoria's Secret. And that's where, last week, I caved and bought shave cream. What's with me these days, carrying a wallet and buying shaving lotion? Does this mean I've finally grown up? 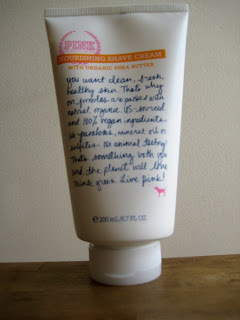 From the new Pink organic and 100% vegan body care line: sulfate and paraben-free shaving cream, which is what I want from all my skin products these days. And no animal testing, so ditto. I'm sure a lot of you have figured out that once you go all natural, you can't go back, so I'm relieved the big chains are finally jumping on board. Pros: no stinging after shaving underarms and immediately applying my all-natural Arm and Hammer deodorant. Cons: although none of the products have a heavy fragrance, a couple don't smell so natural to me. Too sweet and fake. How cool! VS doing organic! Haha -- I thought I was the only one who didn't bother with shaving cream. I usually reach for the conditioner too. I think it is still difficult for many to get into 'natural' since they don't always smell the way that we want to. I'll go check this out when I am in the US next month! Love some sweet smelling skin.